A federal judge dismissed all charges against Nevada rancher Cliven Bundy, his two sons and another man on Monday after accusing prosecutors of willfully withholding evidence from Bundy’s lawyers. U.S. District Judge Gloria Navarro cited “flagrant prosecutorial misconduct” in her decision to dismiss all charges against the Nevada rancher and three others. 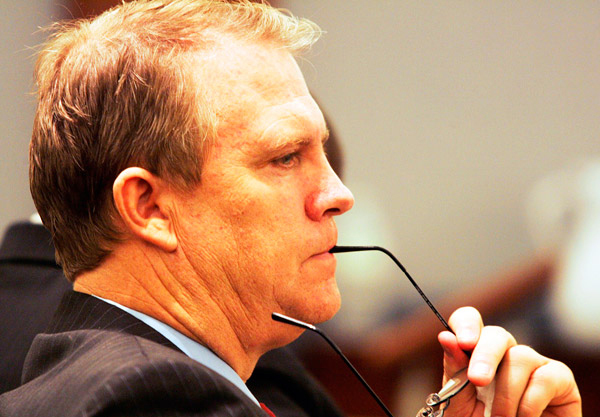 “The court finds that the universal sense of justice has been violated,” Navarro said. Bundy’s supporters cheered as he walked out of court a free man, hugging his wife. He said he’d been jailed for 700 days as a “political prisoner” for refusing to acknowledge federal authority over the land around his cattle ranch. On Dec. 20, Navarro declared a mistrial in the high-profile Bundy case. It was only the latest, stunning development in the saga of the Nevada rancher, who led a tense, armed standoff with federal officials trying to take over his land. The clash served as a public repudiation of the federal government. The Brady rule, named after the landmark 1963 Supreme Court case known as Brady vs. Maryland, holds that failure to disclose such evidence violates a defendant’s right to due process. The 71-year-old Bundy’s battle with the federal government eventually led to what became known as the Bundy standoff of 2014. But it began long before that. In the early 1990s, the U.S. government limited grazing rights on federal lands in order to protect the desert tortoise habitat. In 1993, Bundy, in protest, refused to renew his permit for cattle grazing, and continued grazing his livestock on these public lands. He didn’t recognize the authority of the Bureau of Land Management (BLM) over the sovereign state of Nevada. The federal courts sided with the BLM, and Bundy didn’t seem to have a legal leg to stand on. Nevertheless, the rancher and the government continued this dispute for 20 years, and Bundy ended up owing over $1 million in fees and fines. Things came to a head in 2014, when officials planned to capture and impound cattle trespassing on government land. Protesters, many armed, tried to block the authorities, which led to a standoff. For a time, they even shut down a portion of I-15, the main interstate highway running through Southern Nevada. Tensions escalated until officials, fearing for the general safety, announced they would return Bundy’s cattle and suspend the roundup. Afterward, Bundy continued to graze his cattle and not pay fees. He and his fellow protesters were heroes to some, but criminals to the federal government. Bundy, along with others seen as leaders of the standoff, including sons Ammon and Ryan and militia member Ryan Payne, were charged with numerous felonies, including conspiracy, assault on a federal officer and using a firearm in a violent crime. They faced many years in prison. The Bundy case finally went to trial last October. But just two months later, it ended with Navarro angry, the feds humiliated and Bundy – at least to his supporters – vindicated. 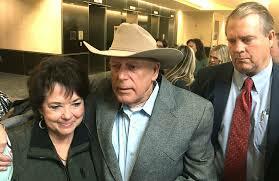 Navarro said Monday it was clear the FBI was involved in the prosecution and it was not a coincidence that most of the evidence that was held back – which would have worked in Bundy’s favor – came from the FBI, AZCentral reported. The newspaper said after the courtroom doors opened following Navarro’s ruling, a huge cheer went up from a crowd of spectators that had gathered outside. Fox News’ Greg Norman and The Associated Press contributed to this report.